The new Executive Assessment or EA exam is a GMAT-like exam developed by the Graduate Management Admission Council (GMAC, the same organization that develops the GMAT). The EA exam consists of 40 questions and is, in essence, a short version of the GMAT. The EA exam is designed to help business school admissions committees assess the general readiness and critical thinking skills of experienced business professionals who are applying to an Executive Master of Business Administration (EMBA) program. The exam has three sections: integrated reasoning (i.e., questions related to the ability to read and interpret charts and graphs), verbal reasoning (i.e., critical reasoning, sentence correction, and reading comprehension questions) and quantitative reasoning, which requires basic arithmetic and algebra knowledge applied to word problems and what are called "data sufficiency" questions. As with the GMAT, the quantitative section, while requiring knowledge of mathematical concepts, is primarily a test of logic and critical thinking. The exam tests your ability to, given a basic understanding of key math concepts, reason through obviously incorrect answers and quickly arrive at what must be the correct response. An online Executive Assessment tutor from MyGuru would leverage official EA test prep materials from GMAC.com. He or she would help you build a customized study plan, complete with assigned practice problems, practice tests at regular intervals, and obviously customized review of key concepts and test-taking strategies. Our base rate for Executive Assessment tutoring is $109, and we also offer 5, 10, or 15 hour packages which come with discounts of 5, 10, or 15%. That's a long term rate of $109 × 85% = $92.65 per hour, so if you choose a 15 hour package, that's a total cost of $92.65 × 15 hours = $1,389.75. We believe that our approach to online instruction provides a more instructive and intuitive experience than anything else in the online test prep market regardless of price. After each session, which you have the option to record in full for later review, our students receive that day's whiteboard filled with notes and tips specifically tailored for them to refer to forever. 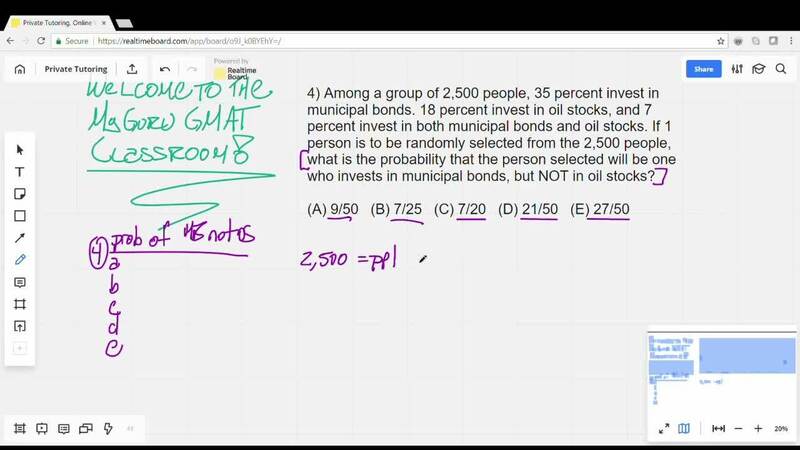 The example video below reflects a GMAT tutoring session, but the Executive Assessment exam consists of the exact same types of questions as the GMAT. ...but students can also sign up for their own personal whiteboard, so they can use a pen tablet to work on problems live with their instructor and access all past sessions. Most importantly, whether you choose your own or shared whiteboard, all GMAT sessions are recorded as digital documents, so students can review lessons to reinforce concepts and approaches. Online tutoring requires nothing beyond a laptop, internet, and scratch paper (just like the EA exam), so computer-based tutoring builds good habits for test day such as writing down process of elimination outlines and taking good notes for reading comprehension. For these reasons, we believe MyGuru online Executive Assessment tutoring isn't just comparable to face-to-face tutoring, it's often better. To read more about our perspective on online tutoring click here. Stefan will assess your starting point and help you develop a customized study plan to prepare for the GMAT as efficiently and effectively as possible. To read about how our GMAT tutors help people develop strategies for passing the GMAT, click here. Click here to read more real reviews from students who have invested in private GMAT tutoring.